Your online reputation is the most crucial in growing your business. Majority of customers are influenced by reviews and information they find online. We will monitor and control your reputation so that it will create a better connection with your customers and creating an impactful online reputation for your business. The amount of status any brand carries in the market directly affects its customers and productivity. The process of repairing all the negative impacts that your product carries and building a brand reputation in the market and to protect it at present as well as in the future. We start with the detailed reputation report that plots the negative and positive content found on the different pieces of the web. The report recognizes the quality of the various adverse outcomes and calculates the difficulty of effectively removing them. When the report is completed, we build a reputation strategy that outlines all the required steps to help remove and suppress them. 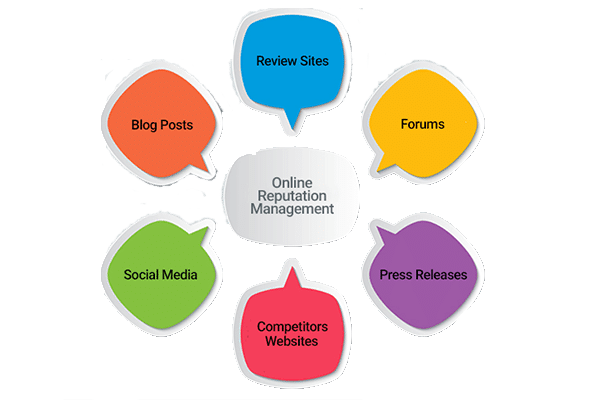 We provide a host of online reputation management services which includes online monitoring, social media monitoring, review and negative comment management, response, brand preservation, and positive reputation management. We offer an extremely targeted reputation monitoring service that continues to watch your brands online and addresses concern immediately. This kind of methodology enables companies to rest assured that their brand is protected online.